Here you can find some of the projects I have done together with my students, in my work as a teacher. ​Inspired by Årstaskolan me and the first graders in my class decided to learn more about rhetorics and giving speeches. Just like Årstaskolan, and with their teacher's guide, we started the project Tala som Ted (Talk Like Ted). The seven year old students in my class held their speeches during a open house at our school, in the spring of 2015. Here you can see and hear the result. 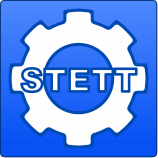 ​The 14th of february 2014 the schools in East Huddinge primary area held the STETT show, inspired by the BETT show in London. Teachers from five different schools participated and held workshops, lectures and showcases to share and teach each other in the spirit of real peer learning and sharing is caring. I was the main orginazier behind the event, and the one who held all the stings. Read more here, and watch some of the lectures.